As beautiful blonde Melanie Daniels (Tippi Hedren) rolls into Bodega Bay in pursuit of eligible bachelor Mitch Brenner (Rod Taylor), she is inexplicably attacked by a seagull. Suddenly thousands of birds are flocking into town, preying on schoolchildren and residents in a terrifying series of attacks. Soon Mitch and Melanie are fighting for their lives against a deadly force that can't be explained and can't be stopped in one of Hollywood's most horrific films of nature gone berserk. Alfred Hitchcock demonstrates what we all know: icily beautiful blondes are the root of all evil. Whether they stimulate madness in a poor innocent innkeeper ala Psycho or drive some miserable schlub to the point of obsession in Vertigo, they're always there, causing all sorts of difficulties. Anyway, Hitchcock doesn't seem especially fond of blondes himself, as they so often seem to end up in a rather bad way; actually, these women rarely make it to the end credits. I won't tell you whether that's the case with Hedren in The Birds, but suffice it to say that she faces a tough road. And an awfully exciting one, for that matter. I'd seen The Birds previously and I didn't remember thinking all that much of it. However, that was a long time ago, and now that I've watched it again, I don't know what was wrong with me; this is one exceptionally cool movie. I really liked Psycho and think it's probably superior to The Birds as a film, but I didn't find it to be scary. Yeah, Psycho offers a few nice jolts, and it's also a certainty that the way its images have pervaded popular culture lessens any potential blows. However, I think it's better as a perverse character study than as a true horror movie, largely because of the strength of Anthony Perkins' fantastic performance as Norman Bates. The Birds, on the other hand, really delivers some solid chills and thrills. I can't say the movie freaked me out or anything, but it's been about 20 minutes since I finished watching it and I'm still about shaken by it. At the risk of sounding arrogant, I'm very rarely affected by horror films, but it's a genuinely frightening movie that definitely got to me. A lot of the reason for that comes from the fact that The Birds takes place in a very mundane setting and the terror seems so happenstance. All of a sudden, these winged demons just decide to take out their bad moods on the residents of tiny Bodega Bay, California. And it's not big, scary birds that attack. No, it's common sorts such as crows and seagulls who do the damage. That last point is an absolute masterstroke, since it again brings home the terror. This isn't some remarkable species like the Great White Shark of Jaws. These are the same birds we see everyday, but they've simply decided - for no apparent reason - that they don't much like us anymore. The randomness and incoherence of the attacks is also another cool part of the film. We never have the slightest idea why the birds go nuts, other than that (possibly unrelated) connection to Hedren. Even if she shares some mysterious negative bond with the birds, this is never explained, nor is any other reason for the madness given; it all just happens, without warning and without cause. If there's anything that's truly scary, it's madness without explanation. We like to bottle up horrible events in easily-digestible ways, like the serial killer who was abused as a child or whatever. Sometimes, it doesn't work that way. I work with children, some of whom have serious emotional concerns, and while in the vast majority of cases I can discern some pretty obvious reason for the child's trauma, every once in a while it comes down to nothing that makes any sense. The kid will seem to have all positives in his life but he'll still be a mess. The Birds reminds us of that aspect of life, that bad things can happen to good people and much of our existences come down to just randomness. Hey, I don't expect to be attacked by a horde of wrens tomorrow, but who's to say it won't happen? That's what makes The Birds so genuinely terrifying; something horrible can happen to us at any time and we're utterly powerless to predict or stop it. So if you're looking for a "feel-good" movie, The Birds is not the place to look, even more so than most of Hitchcock's films, which clearly tend to be quite dark. That doesn't mean the movie's a consistently gloomy and dire affair. On the contrary, there's a lot of humor and levity in it, and we even see the blossoming of a new romance between Daniels and Mitch Brenner (Rod Taylor). In typically misleading Hitchcock fashion, that latter concern actually seems to be the crux of the story for much of the first half of the film. Of course, it's not, as the title of the film tells us. Though I suppose one could stretch it and reason that the movie's name is a play on "lovebirds" - which feature prominently in the early going and would describe our protagonists - the title sequence definitely demonstrates the more ominous tenor of the story. I must admit I wish I could see films like this with no foreknowledge, though I'm not sure it would make much of a difference. As it stands, I found The Birds to be so powerful that I doubt additional ignorance would have made it more so. Put simply, this is a tremendous film. I love the fact Hitchcock didn't include a score with The Birds. It's something I wish happened more often, because I think the lack of manipulation that comes with movie music frequently makes the events more terrifying. For example, on the Psycho DVD, the supplements includes the famous shower scene both with and without Bernard Herrmann's classic score. At the risk of sounding heretical, I thought it was more horrifying and powerful without the music because it all seemed so much more real and gruesome. Music tends to put an artificial sheen on top of the events and makes them appear more fantastical. Without that, you're just confronted with the stark reality of the events and their impact sometimes can be much greater. No, I'm not calling for the abolishment of all movie scores, for they usually serve a definite purpose; the heroics in Star Wars seem all the more grand due to John Williams' music, and the minimalist piano of Halloween adds greatly to the tension. At least in the case of The Birds, however, I think Hitchcock did the right thing by making it music-free, especially since it's one of his least theatrical productions. Not that The Birds is shot like a documentary, but Hitchcock seems a bit more restrained than usual and keeps things on a fairly objective level. The acting appears less grandiose than typical as well, and all the performers offer solid work. Of special note was very young Veronica Cartwright as Cathy; her shrieks of terror in Alien were absolutely amazing, and here we see that she had similar power even as a kid. Good performances, memorable use of sound, and a terrific premise: all of those help make The Birds a winner. I’ve heard rumblings of a remake, but I hope Hollywood leaves well enough alone. This film is more than good enough to stand on its own, and it doesn’t need an update. 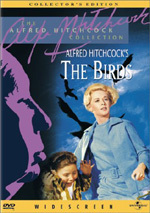 The Birds appears in an aspect ratio of approximately 1.85:1 on this single-sided, double-layered DVD; the image has been enhanced for 16X9 televisions. The Birds provided a very inconsistent picture that ranged from crystal-clear to badly flawed. Sharpness varied quite a lot. Most relatively close shots appeared crisp and well-defined, but when the camera moved back a bit, haziness tended to occur. One exception to that rule came from close-ups of Hedren. Hitchcock just loved to use soft-focus on his leading ladies, and this technique resulted in frequent lapses in sharpness. Take the pet store scene early in the film, where cuts from Hedren to her costars go from blurry to crisp in the blink of an eye. The whole use of this technique seemed odd to me - after all, the illusion is broken when Hedren's in a shot with others, since those are focused properly - but hey, he's the master of cinema, so who am I to complain? Jagged edges and moiré effects created no concerns, but fairly prominent edge enhancement popped up through the movie. I noticed occasional speckling and some examples of thin lines marred the screen as well as some nicks and marks. Quite a lot of grain could be discerned during the film, especially due to the frequent use of process shots. However, even in scenes with no effects, I often thought they demonstrated an excessive amount of grain. One qualitative note about the effects: though they clearly seemed dated, they actually worked well. The composite sequences really presented the images of bird attacks as convincing occurrences. Yes, some fakery could be detected without too much trouble, but the overall impression was very good. Colors were decent but generally seemed a bit pale, and flesh tones were somewhat flat and muddled. A few exceptions occurred; for instance, when we first met Black levels, on the other hand, appeared quite deep and rich, and shadow detail looked very good. Actually, some of the film's darker scenes - like a chilling piece inside a house - looked better than daylight scenes since they revealed fewer of the print flaws. Ultimately, The Birds presented a flawed image that came across as a bit below average. I found the movie's monaural audio to be problematic for different reasons. It's a very simple track since a) it's mono, and b) there's no music; it only offered dialogue and effects. The effects were just fine; from ambient sounds in the environment to the bizarre - and creepy – electronically altered noises made by the birds, they came across without many hitches. Speech, on the other hand, seemed less appealing. The dialogue clearly was heavily dubbed, but not in an effective manner. Oh, it seemed clear and intelligible, but the re-recorded speech did not blend well with the movie; it appeared vaguely artificial and really stood out in a negative way. I also noted some occasional hiss during dialogue. Overall, the audio of The Birds seemed adequate for such an old movie, but the dubbed dialogue caused some problems. the Birds provides some fine supplements. First up is a terrific 80-minute documentary called All About The Birds. It combines modern interviews with archival materials and movie clips. We hear from Hitchcock’s daughter Pat, production designer Robert Boyle, screenwriter Evan Hunter, matte artist Albert Whitlock’s colleagues Syd Dutton and Bill Taylor, storyboard artist Harold Michelson, Hitchcock collaborator Hilton Green, actors Tippi Hedren, Veronica Cartwright and Rod Taylor, filmmaker Peter Bogdanovich, author Robin Wood, makeup artist Howard Smit, and Bernard Herrmann biographer Steven Smith. The program starts with a discussion of how Hitchcock chose a follow-up to Psycho and goes through the development of the script. From there we hear about the use of matte shots, storyboards, visual effects, casting and working with Hitchcock, locations and sets, stunts and filming the bird scenes, the movie’s themes and cut sequences, editing and alternate endings, the absence of score and the use of electronic sounds, and reactions to the final film. “All About” really covers a lot of territory in fine form. Its 80 minutes fly by as we scoot from one interesting subject to another. We learn tons about the making of the film in notes that vary from basic nuts and bolts to terrific anecdotes. This is a serious winner of a documentary. A number of other strong supplements appear as well. One small disappointment comes from the two sections that offer unused material; one is called Deleted Scene and the other is titled Original Ending. Unfortunately, neither shows any actual film footage. It turns out the ending was never shot, while the other scene was filmed but apparently lost. As such, in these sections we see script excerpts plus production photos (for the "Deleted Scene") or conceptual drawings (for the "Original Ending") that let us know what these pieces would have been like. It's not quite what I expected, but at least they made the effort to convey this information, and I appreciate that. Another unusual presentation occurs in the Storyboard Sequence section. Unlike the typical film to storyboard comparisons, this piece shows storyboards and then displays still photos of the relevant scenes, all from the attic sequence. I'm not a big fan of storyboards, but this presentation works pretty well. One very interesting section shows much of "Tippi" Hedren's screen tests. These shots run for about nine and a half minutes, and they offer a fascinating look behind the scenes. Hedren interacts with Martin Balsam and we hear Hitchcock himself give directions off-camera. This is one very cool extra! Other fun supplements come from two included "Universal Newsreels". One lasts about 70 seconds and is called The Birds Is Coming; it's a fairly straight promotional piece that shows Hitchcock and Hedren as they shill for the movie, and it's entertaining. 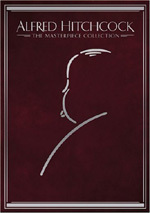 The other, titled Suspense Story: Nat'l Press Club Hears Hitchcock, is more interesting because the 110-second piece shows a lecture given by Hitchcock to the National Press Club. While neither is quite as fascinating as the promotional newsreel found on the Psycho DVD, they're both still quite useful. A funny trailer in which Hitchcock slyly points out all the reasons birds may not be too happy with humans also shows up on the DVD; it's not quite as good as the classic Psycho preview, but it's very entertaining nonetheless. Finally, 81 screens worth of Production Photos finish up the package; these include publicity shots, movie posters, and more candid on-set shots. All in all, it's a fine grouping of supplements that definitely added to my enjoyment of the film. Not that a movie as terrific as The Birds needs extras to make it compelling; this DVD would be a must-have even if it were a "movie-only" package. As it stands, although the picture and sound are medicore, the supplements are very good and the film itself is absolutely top-notch. The Birds may be Hitchcock's scariest film, and the DVD comes highly recommended.